The Cs-134/137 activities were measured from different tree organs of spruce, larch and sycamore maple. Two locations in South Bavaria were monitored during a period of 2.5 years following the Chernobyl accident. Samples taken in 1985 allow to determine the Cs-137 contamination before the accident. Increasing Cs-137 activities from older to younger needle years ofPicea abies caused by root-uptake of the global weapons' fallout are due to the high phloem mobility of this element and the remaining of the needles at the tree for about 6–7 years. In contrast, the Cs-137 activity was much smaller in leaves of larch and sycamore maple. 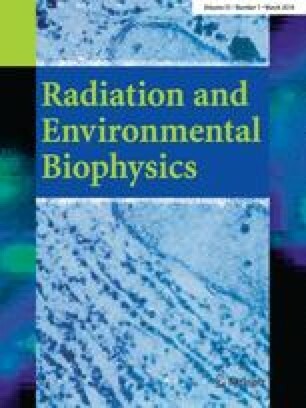 After the Chernobyl accident, the higher contamination of spruce > larch > sycamore maple is dependent on the roughness of bark, absolute bark surface and the existence of leaves during the deposition of Chernobyl-derived radioactivity. The Cs-134/137 activity (Bq/kg d.w.) was about 25-times higher in bark compared to wood ofPicea abies and 1.5–4.7 times higher in directly contaminated twig-axes than in leaves. Till the end of the investigation the major contamination of the shoots was due to direct deposition of cesium on the trees. A maximum of 5–15% of the total activity of the directly contaminated branches of the plants was calculated to be part of root-uptake, depending on the amount of initial retention. 20% of the translocated cesium into new leaves of larch and about 50% into sycamore maple resulted from root-uptake 2.5 years after the accident.